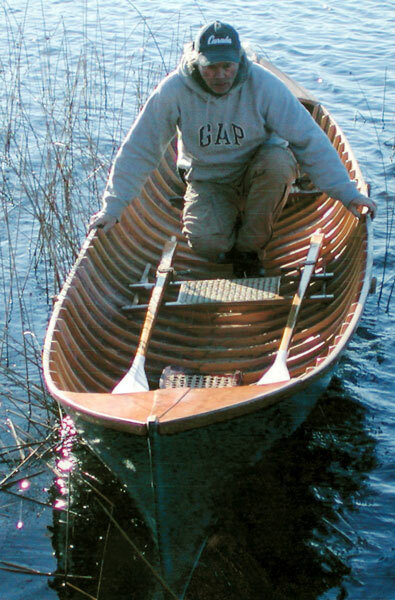 "The Adirondack Guideboat" by Ken and Helen Durant was the source for Bill Stark's JOSEPHINE, a 16'6" x 38" guide boat with a few modifications. He extended the length 6" in an attempt to give her "less of a stubby look." He also redesigned and rebuilt the stem 3 times to lessen the tumblehome lines common to most guide boats and because he "has a finicky eye." He writes that he spends much time educating the public, who assume it is a canoe and wonder why he is rowing it, rather than paddling. The boat is fiberglass over stitch-and-glue mahogany plywood. Contact Bill at caunk03@telus.net.